Open the application and from the file menu choose "open" to import a UFO. Or, drag a UFO file on the application icon in your dock. When you change and save your UFO in an other application, roundingUFO will notify you to reload the changes. Select a glyph from the glyph list and it will be previewed. With the search box you can select a glyph by typing the name of a glyph. The first effect converts your corners to round ones. The second adds inktraps to your corners. The last one just cuts off your corners. 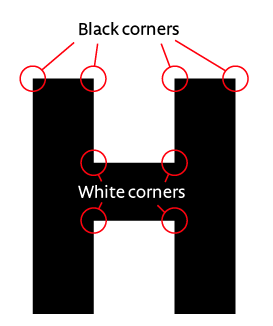 Black corners: corners inside the glyph. White corners: corners outside the glyph. 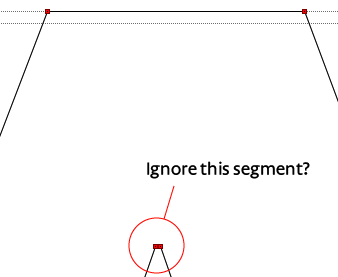 The "ignore short segment" slider allows you to ignore segments which are shorter then the slider value. For example, short segments frequently appear in the top of a capital "A". For inktraps there is an inktrap lenght slider. With the 'display...' drop down menu you can change the preview of the glyph. By double clicking on a glyph in the glyph list, you go from Global to Local and vice versa. When Local is applied, you can apply different parameters only to this glyph. Whereas with Global, the same parameters are applied to all "Global" glyphs. You can store you parameters by hitting 'store'. You tag the parameters with a name and later on you can reuse them by hitting load. 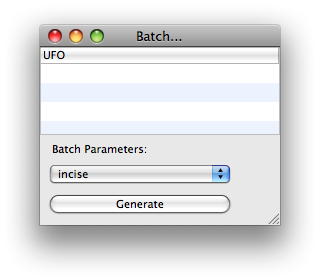 For generating a UFO with the parameters set, go to File->Generate UFO. And you are done. It is advised to check the contours. Just drag and drop your UFO family on top of the list, choose a stored parameter setting and have fun.